On this Private Custom Profit Blueprint Consultation Call Scott will walk through your goals and help build your Lifestyle Practice Model. You will walk away understanding how to experience a lifestyle you truly enjoy, enabling you pursue your passions / your interests, and achieve significance outside of Dentistry… All with the peace of mind knowing you have the most fitting growth plan for your specific circumstances. Please bring your toughest challenges, your most burning questions, and take advantage of this unique and exclusive opportunity to talk directly with Scott J Manning, MBA. Be prepared for a candid, frank, and intense conversation that just might be the most powerful talk you’ve ever had with insight into your practice growth. For one doctor, just a small change in the scripting language and fee presentation closed an $89,000 case that took the practice from $110K to $200K. That same practice employed Scott’s Treatment Follow-up Process and closed $16,000 over the phone. 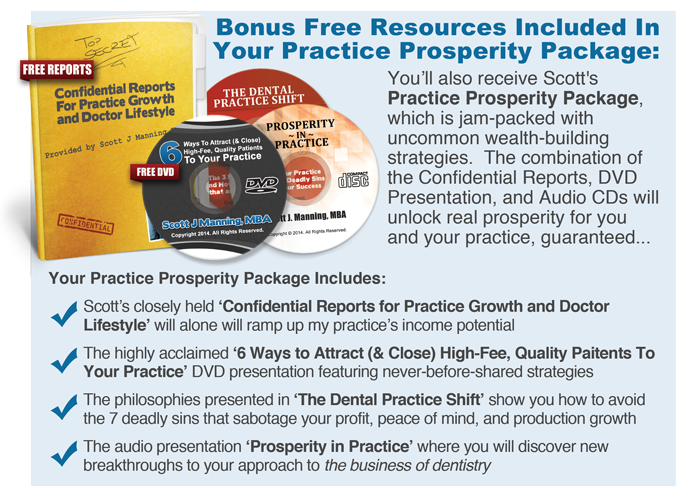 In total, they nearly doubled their practice in just 67 days after taking Scott’s advice. Another office, Scott encouraged them to change the Value of the Procedures allowed to be scheduled in the morning and doubled the hourly value in 2 weeks. That extrapolated out over 6 weeks will double the Practice, just by applying simply techniques. "I’d just tell you to call Scott… Anybody who’s at a crossroads of, “Okay, what do I need to do?” and they want something more but they don’t necessarily know how to get there, that’s what he’s great for. So my advice to anyone would be if you have a lot of ideas and you know you want to do more but you don’t know what that is or how to go about doing it, having a business mentor like Scott is what you need." "I finally pulled the trigger and did the conference call and talked to him and we kind of hit it off right off the bat. I needed a coach to get me where I want to go and the thing I liked about Scott was the uniqueness of the way to get there… I just say there’s no time like the present. If you’re not happy with your current situation, you’ve already recognized that you’ve got to do something different and if you want to do something different in a very different way, I think Scott’s who you need to look towards." 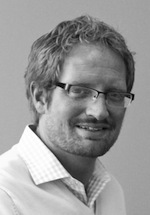 "Scott has an amazing ability to communicate effectively on a personal level and to energize you at the same time. That is really what excited me and I could see that applying that to communication that would be coming from my office could only be an amazing benefit. So his logistical ability, his planning, his foresight, his excitement, his energy, his confidence, and all of that wrapped into great communication." a Complimentary Custom Profit Blueprint Call! * All information submitted is CONFIDENTIAL and WILL NOT be shared with anyone under any circumstances. Please provide the best Phone Number to reach you in order to coordinate your Profit Consultation Strategy Call, if we are not able to confirm your call it will delay your scheduling. Please provide your Fax Number in order to receive confirmation of your request and the notification of your Practice Prosperity Package shipment date. What questions do you have about growing your practice? Thank you for sharing this information with us. All information is submitted SECURELY and kept CONFIDENTIAL. It WILL NOT be shared with anyone under any circumstances. *Discloser: These calls are strictly limited to serious doctors, with a waiting list of up to 3 weeks in advance. It’s time dentists like yourself demand more from your practice. You make the world more confident, healthier, and give your Patients beautiful smiles. Yet, often times, dentists sell themselves short, struggle to be true to your own goals and objectives, and let others (staff, patients, family and friends), dictate your future. Being a Super Star Dentist is about more than just taking care of patients and paying your staff, it is about standing up for what you believe in, what inspires you, what you are about…it’s about being proud to be in this Industry and making the most of your Practice and living your dreams too! “I am on a mission to reward you for your hard work and making owning your Dental Practice fun again. Regardless of how successful you consider yourself now, you will benefit from my complimentary Custom Profit Blueprint Consultation Call that will inspire you, inform you, and ignite your passion again for living out your dreams and putting you back in control.